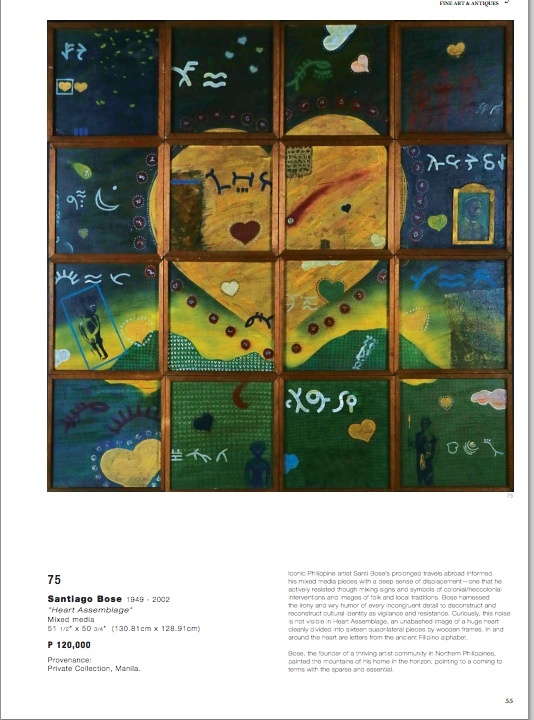 Page 55 of the Issuu catalog of the “Magnificent September Auction” with the untitled painting by Rene Aquitania, dubbed “Heart Assemblage” by Leon Gallery and attributed to Santiago Bose. Is it a Santiago Bose? From the moment I laid eyes on it, I knew it wasn’t my dad’s. The painting, titled ” Heart Assemblage,” was part of the Leon Gallery auction that will be held on Sept. 28. A giant yellow heart, rising over distant mountains like the sun, framed by ethnic figures. What looked like a Masferre photo collaged onto the work. Littler hearts were echoed throughout the image. The work itself was segmented into a grid by wooden panels. It was a pleasant enough piece, but it wasn’t a Santiago Bose painting. My mom emailed me a photo from the “Magnificent September Auction” catalog. To the untrained eye, “Heart Assemblage,” a painting created with mixed-media, involved many elements that could lead people to believe it was created by my father — the subject of the Cordilleras, the use of photo and collage over paint, the layering of ethnic imagery over the painting. But my father’s work always had a strong narrative; despite the fact that his paintings LOOKED haphazardly done, there was a reason for every visual element in his work. 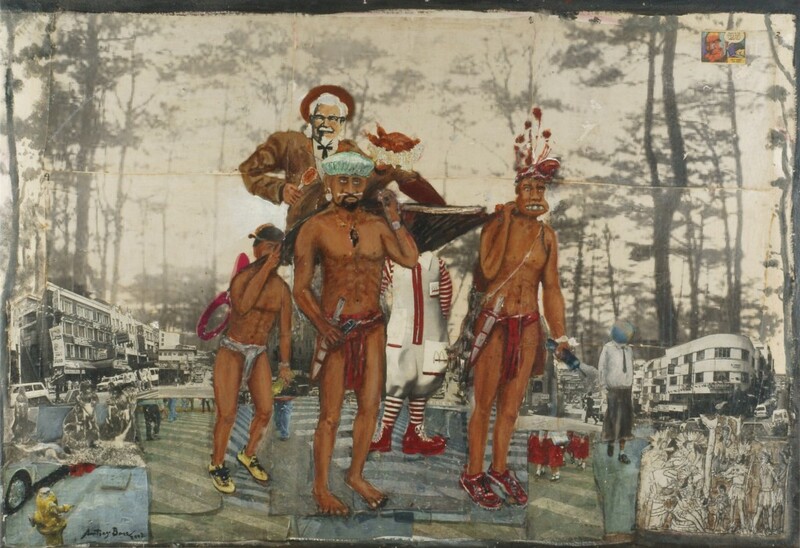 In his painting “Carnivores of the Session Road,” for example, he superimposed Ifugao natives in rubber shoes carrying Col. Sanders on their shoulders walking down Session Road. It was a commentary on the insidiousness of colonial imperialism, and how Filipinos lived it everyday. There was nothing like that in “Heart Assemblage.” That painting title, too, was problematic. My father would’ve considered himself too clever for a title like that. “How baduy naman the title!” he would’ve said, mocking his Catholic school-educated children with a fake colegiala accent. Plus, we were always around his paintings. Except for the paintings created abroad during artist-in-residency stays, my father painted in his Baguio studio and sometimes studied his paintings for days–even weeks. As his daughters, we would see a work on an easel and grow familiar with the process and the changes created within them. I never saw this piece, and neither did any of his close friends. And of course, there was the fact that it was unsigned and undated. To my father, a work was not finished until it was signed and dated. Hardly any works of his exist without his signature, except for the ones he was working on before he died. A painting would not leave his hands without his mark. And so my family, with the help of the folks who run Tin-Aw Gallery (they represent my dad’s work), investigated. Right before my father died in 2002, he commissioned a catalog of all the works he’d ever created; numerous drawings, prints, paintings, sculpture, book cover illustrations, written work, installations, and videos, were documented and cataloged by his assistant in 2001-2002. No mention or documentation of a work called “Heart Assemblage,” with a similar description or dimensions, existed. My mother visited Leon Gallery to look at the painting, where gallery owner Jaime Ponce de Leon claimed that the painting was acquired directly from the artist himself. Ponce de Leon said that the signature was probably hidden in the alibata; a claim that sounded ludicrous as my father would never hide his signature. 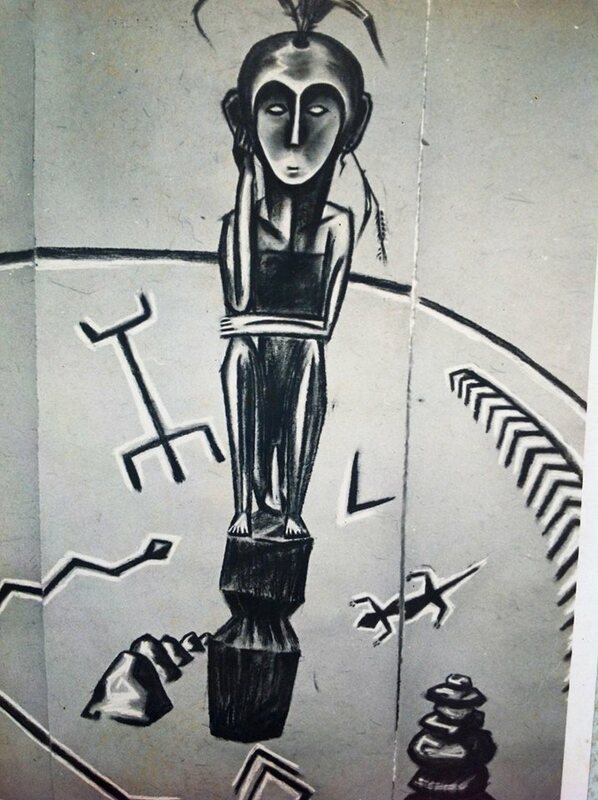 Through phone calls and emails to friends, my mother learned that in fact, the painting was acquired from Wahoo Guerrerro, an acquaintance from the 1970s. Wahoo’s daughter Katya told my mom that the painting must have come with the sale of the building owned by Briccio Santos, who also owned Brix Gallery that was in the building itself. Briccio, and his wife Peachy, owned Cafe Amapola in Baguio. The space contained a gallery, and it was a hub for Baguio artists in the 1980s. It was where many young and aspiring Baguio artists exhibited their works. The work was produced around the time that my dad worked with several apprentices in Baguio; artists such as Perry Mamaril, Jordan Mang-o-san, and others. It was a time when his growing influence was seen in the works of many Baguio artists. 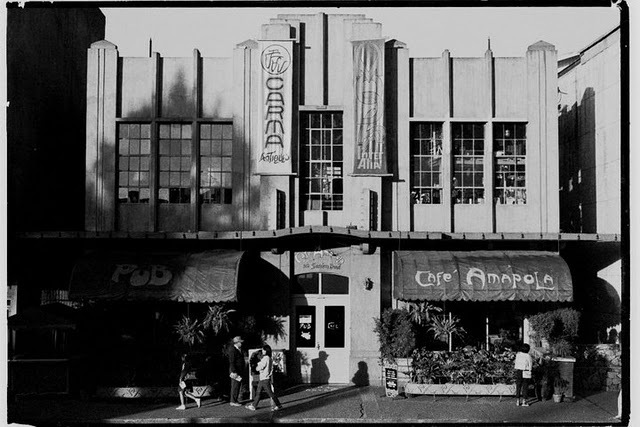 My mother figured that the painting was exhibited at Cafe Amapola prior to the sale of the building and mistakenly attributed to Santiago Bose because the buyer thought it had some similarity to his work. Unfortunately, this wrong notion was never corrected. There was conjecture about the possibility of a Santiago Bose signature in the back of the painting, but Leon Gallery had replaced the backing because it was old and worn-out. At around this time, my mother explained the matter, in an email and a hard copy of a letter (received by Leon Gallery on Sept. 16) sent to Ponce de Leon. She also asked him to “kindly and immediately remove the name of Santiago Bose as the creator of ‘Heart Assemblage.’” Leon Gallery never removed it — and in fact it is still in their Issuu catalogue today. My mother never heard back from Ponce de Leon, or anyone from Leon Gallery. The question here then, is how did this happen? Why won’t a gallery do due diligence on the provenance of a painting that they are auctioning? How can they stand by a work knowing that it is being questioned by the family of the artist? That is a question for Leon Gallery, and we do not know the answer to that yet, as they never replied to our correspondence. My mother believes this was a case of a mistaken notion that was perpetuated without malice. But for a gallery with a huge responsibility to its clients, there has to be a systemic check of provenance. Rumors started flying in the art community about the work; that my family was claiming it was a fake, because Tin-aw wanted to sell the Bose paintings they had. All ridiculous claims. No one bothered to check whether an unsigned work belonged to the artist himself, if indeed, it was acquired before his death in 2002. We, neither Tin-aw nor I, never mentioned the word “FAKE” in any of our emails and verbal communications with the people we talked to when we were tracing the provenance of the painting . Why would I call it a fake when it is not signed by Santiago Bose? When you asked me at your gallery what I thought of the painting, I told you , “I’ve never seen it, and I it doesn’t seem to be his”. And I can forward to you emails I sent to different people…artists, gallery owners, critics because I wanted to find out what they thought of it and who might have done this work that is attributed to Bose. That Tin-aw and I are “spreading this rumor about a fake Santiago Bose in Leon Gallery so we can sell the paintings that we have” is totally laughable if not downright dismissible. In the absence of the artist who has left quite a legacy in Philippine art, and who has wielded enough influence among young and contemporary well-respected Filipino artists, my family and I will leave no stone unturned to protect his name and his legacy. I also strongly believe that art dealers should be very careful in knowing and documenting the provenance of their work. They owe it to their collectors and to the artists as well. Money is not everything. Great art is. And what’s with that “so baduy naman” title? Apparently, Jaime Ponce de Leon told Tin-aw and my mom that the title “Heart Assemblage” was just a title invented by the current owner. That’s not a practice that I’ve ever heard any gallery do before; in the absence of a title, it would just be acknowledged as “Title Unknown.” So what does that say about the integrity that Leon Gallery gives to the work they sell? According to Tin-aw’s Dawn Atienza, while the auction house is responsible forthe items they are selling, most are not legally required to ensure authenticity. “It is an unfair practice that even big auction houses can sell artworks of unclear provenance, leaving the bidders with the responsibility to thoroughly investigate. But when push comes to shove , most auction houses pull out works which are questionable , especially if there is a strong case presented against it from the artist’s family , collectors and fellow artists,” she said. My dad used to talk to young artists about work in a teasingly deprecating manner; he would look at a painting or a sculpture and ask, “Is it art, or is it fart?” He was being funny, sure, but he was seriously asking a philosophical question too. He wanted artists to respond, to defend their work, to stand by it, to say it was worth something. By not properly investigating and knowing the provenance of the work that they are selling, the gallery owners may as well be selling farts.